Black and white image of two young women wearing fancy tone-on-tone striped dresses with pleated skirts and satin yokes and sleeves. One girl is seated, and one is standing,. Both wear their hair up with a bow, though the standing girl's bow is much larger than her companion's. 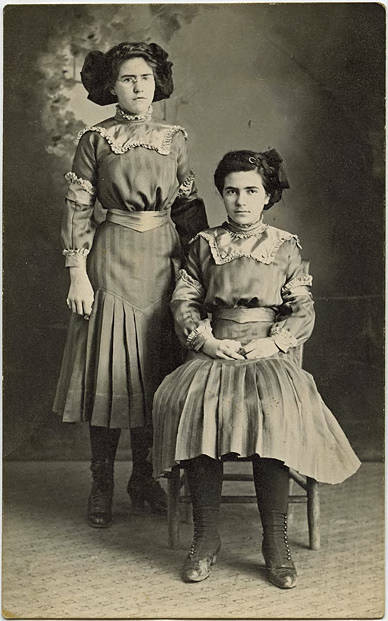 Girls' clothing in the 1910s especially became more child-friendly. One of the girls in this image is identified as Theresa Hendricks, the other is most likely her sister Edna, two years older than Theresa. Both the girls lived in Cornelius with their family. 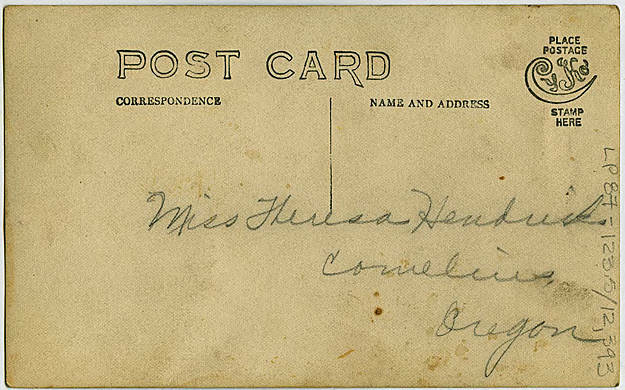 In the 1910 census, Theresa's father, Alphonse, is listed as the proprietor of a general merchandise store.